Hey everyone, I’m going to start this off as if it were a formal letter to a relative (whom you love dearly but do not see all that often) by extending my heartfelt best wishes to you all on this fine, cold, damp October Thursday. Hopefully we’ve all made it to another Thursday in one piece, so here I am, but the real question is, are you here? Yes? Good! Becuse I’m going to be shooting you up with British comic book goodness once again. Whether you like itor not! Remember a while back when I featured Harry Shotton’s first issue of Punks In Space in a Tea Time Thursday.. no? Well go back and check it out, because this time (you guessed it) I’m following up on the second issue of this humourous monthly series. The first issue was an interesting set up and really just set the foundations for this story, so that in this issue, the story could really develop and get going. So I enjoyed the first issue, and thought that it set a good tone for the story. I mean, who wouldnt want to read about punks, in space? Sheldon maybe because he doesnt like fun, but that’s another story! As mentioned and set out by Harry in the first issue then, these are literally punks in space, and they spend their entire lives virtually drunk or high, and that’s all we found out pretty much, accept for something on the final page of #1 (which is something I will come back to in a moment). This issue was better than the first issue for sure, because now that the foundations have been set in stone, Harry can have fun with his story and his characters. The punks arn’t just getting drunk in this issue, oh no, they’re getting drunk and following up on a mystery of sorts! So it’s good that there is a definite plot line emerging. A strong, creative one at that, it may be simple, but it’s good. This issue see’s the punks trying to search their friend’s ship to find out why the pub was destroyed and to see why the rest of the crew on board are frozen, as if paralysed in time. This time we find out that there is one crewmember on baord called Mary Peril, a fellow punk, who is also one of these people not frozen. She explains what happened, and why everyone is frozen in time, and why the pub got destroyed. It turns out that a while back, while Mary was at an intergalatic music festival, she bought some acid tabs from a dodgy looking shifty old man (who later ran away rather suspiciously) who claimed that they were so strong, that they were making him high just looking at them. As Mary claims her middle name is literally ‘Danger’, she takes a few of these tabs, and drifts into a state of pure mental abstraction for what feels like days, and she doesnt know what she did during that time high. Until she comes to, and finds herself in a court room being charged for a whole list of crimes.. but then suddenly there was a huge bang, and everyone froze across the Universe. She then said that she found out the only other person to not be frozen from this ‘bang’, was the Chief Of Justice, who told her that the cause of all this was a huge ray, that had frozen anyone who wasnt sober at the time of the blast, and that he wasn’t frozen because he was a secret alcoholic, and Mary had been high on the acid. He tells Mary that he will let her off of all her previous charges if she can go and destroy the ray, saving the universe! The pub got destroyed because Mary’s copilot had recently gone straigh edge and turned frozen as soon as they were heading towards the pub and hit it straight on. Remarkable storytelling if you ask me, Harry Shotton, the comic’s creator really came up with some creative stuff right there! I loved it! This issue ends with another threat, that the ray will go off again at any moment, and that Stu and Twig (the two lesser featured male punks) will be frozen if they don’t get high or drunk soon! Can Mary Peril save them, before it’s too late? One thing I will say I also still really like about Punks In Space, is that the artwork is still a lot of fun, very stylised and the black and white inking is up on decent. As I said in the article I did about #1, it reminds me of one of my favourite comic book artists, Gabreil Ba. So this was a bonus once again, some great paneling and layouts. I want to read more, and I really do think Harry has created something great here, this is one highly enjoyable comic, I’d like to see these collected in some bigger format at some point, but even if that’s not possible, then these single issues will have to do! Check out TTT next week for more British Comic Book reports! 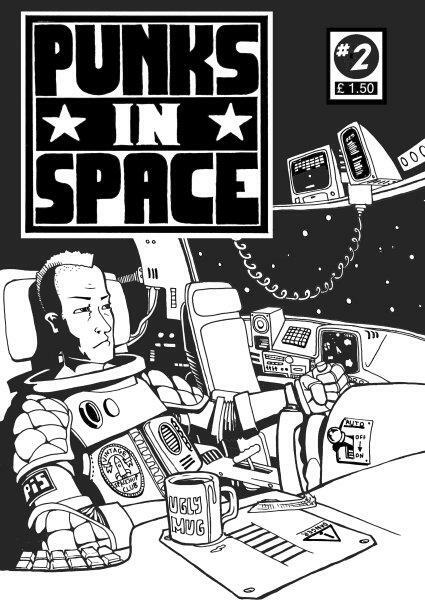 To get your hands on a copy of Punks In Space, if you’re in the UK, you can find copies at all branches of ‘Travelling Man’ stores, in Leeds, Manchester, York (where I get my comics) and Newcastle! If you are in the UK, but can’t get to any of those places to pick up a copy, then Harry very kindly says inside this comic that you can e-mail him at punks-in-space@hotmail.co.uk, and he’ll see if he can send you a copy to your doorstep! Each issue is priced at a modest #£1.50 (well worth every penny if you ask me).